"It's funny how many people accuse me of being mad or geeky - and then they send me photos or ask for more information!" 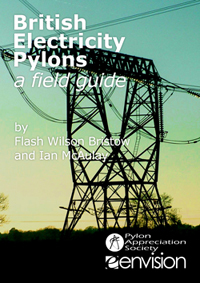 It's simple: the Pylon Appreciation Society is a club for people who appreciate electricity pylons. Enthusiasts range from primary school children to retired engineers and include anyone who is interested or inspired by transmission towers. As well as the wealth of information available through this site, if you choose to become a member there are other benefits including the field guide (pictured, being released in installments), messageboard, and other resources. You will get a welcome pack with photo card, a "parts of the pylon" print, badge, and mini cards. The Junior section contains letters from our younger members as well as a wordsearch, how to draw a pylon, and relevant links. Anyone can become a member for just £15 - to find out more, read the joining page.